It used to be that the only metric salespeople were managed around was how much business was closed, and the data was pulled at the end of the month to know how a salesperson was performing. And while closed business will remain the most important end result for all salespeople, more and more companies are defining a variety of sales metrics and activities that they’re holding their salespeople accountable to. Closed business is what defines how a salesperson gets paid, but with CRM systems being the new normal for running today’s sales team, as well as a plethora of sales technology that’s connected into that CRM, there is data galore. Our team talks to the most modern of sales organizations every single day, and we’re starting to see what we believe will be the “new normal” of running the sales team of the future. These companies are light-years beyond just tracking what’s closed. Sure that remains top of the list, but these companies are identifying the key sales behaviors and activities they want to see out of their salespeople every day, they’re managing and coaching their salespeople around those metrics, and they’ve created an immersive, real-time view into what’s happening right now across the sales organization. Salespeople always know exactly where they stand, and sales leaders and executives have a constant pulse on the business. The first step these companies are taking is to clearly define the makeup of their sales organization by role, and defining the right sales metrics for each. These are the controllable, actionable outcomes that a salesperson can affect through their own efforts. For example, for a mid-market inside sales team we commonly see things like prospecting conversations, qualified opportunities created, and proposals sent. For a field sales team it’s things like face-to-face meetings, executive briefings, and achieving key milestones of the big deal sales process. Once the metrics are defined, the sales operations team swoops in to define how those behaviors and activities are tracked within their CRM system, and then completely immersing the team in progress towards those key metrics. The data becomes inescapable as it’s visible in real time through the CRM system, on mobile devices when someone wants to reflect on their performance, in performance snapshots delivered to their email inbox, and broadcast on TV monitors around the office. Salespeople – They know what’s expected of them, they can see how they are doing compared to their peers on the leading indicators to more sales, and it helps them remain focused on what’s most important. We all know the salespeople who look busy but never seem to close anything, and any salesperson can admit that they sometimes wonder if they’re spending their time on what really matters to help them close more business. Front Line Sales Managers – They are armed with a common set of operating metrics in which to measure their salespeople around, their one-one-ones become metrics-driven coaching sessions, they can onboard new hires faster, and when a sales KPI (for example, prospecting meetings) falls behind they know where to course correct to ensure that next month’s number doesn’t go into jeopardy. Sales Executives – They have a constant pulse on what’s happening across the sales organization, again using a common set of operating metrics, so they can see which managers need help, where there may be capacity constraints in terms of needing more leads from marketing or needing to hire more salespeople to handle increased market demand. There are hundreds of companies taking this new approach, and when you see it in action you can just feel the energy around the office. Salespeople collaborate more with each other as they have a constant view into how their peers are doing compared to them so know who to go learn from and who to celebrate, managers walk with some extra swagger because they feel more in control of what’s happening within the team, and executives value having a real time pulse into how active the sales team is being in the market. Procore Technologies is a high growth construction software company based in southern California, and their sales development team sits right by a full video wall showcasing a real time view of their sales metrics. And it goes beyond reporting what happened in the past, it also tells them where they are behind so they always know then the team needs to pick up the pace. HubSpot is another high growth technology company who went public this year joining the “unicorn club” of companies worth over $1 billion. This team is an icon of using data to manage and grow a sales and marketing team. By shifting from a company that just tracks all the key data into one that immerses the team in the data in real time, they’ve been able to increase team activity by 35% and more importantly are generating over 16% more qualified sales opportunities. 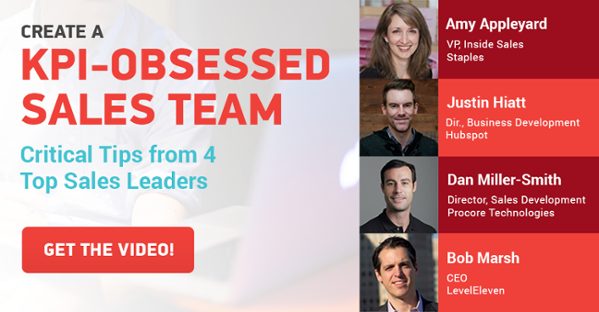 We ran a great webinar recently where sales leaders from Procore, HubSpot, and Staples talked about this topic in detail. More and more companies are using data to understand what’s happening within their company and the next wave is going to be determining the data points that really matter, and using it to drive people to immediate action. Sales management is going real-time. Here's how sales KPIs help modern sales leaders manage in real time, and why it benefits salespeople, front line sales managers and sales executives.